Sitting high in the 2019 Chevy Silverado Trail Boss, with driver’s-side window open, my “Merry Christmas” greeting goes out loud and heartfelt to all the readers. The Trail Boss, a four-wheel-drive crew cab, is a new offroad trim level for the Chevrolet pickup. This one, finished in cajun red, is very visible, perfectly suited to the Christmas column. Color was an attraction a year ago, too, when the 2018 Subaru CrossTrek showed up for Christmas Eve in sunshine orange exterior finish. The “Merry Christmas” shout is a highlight of the year for me. My first time as a Post car columnist was Christmas Eve 1977 from the seat of a ’78 Chrysler Cordoba. 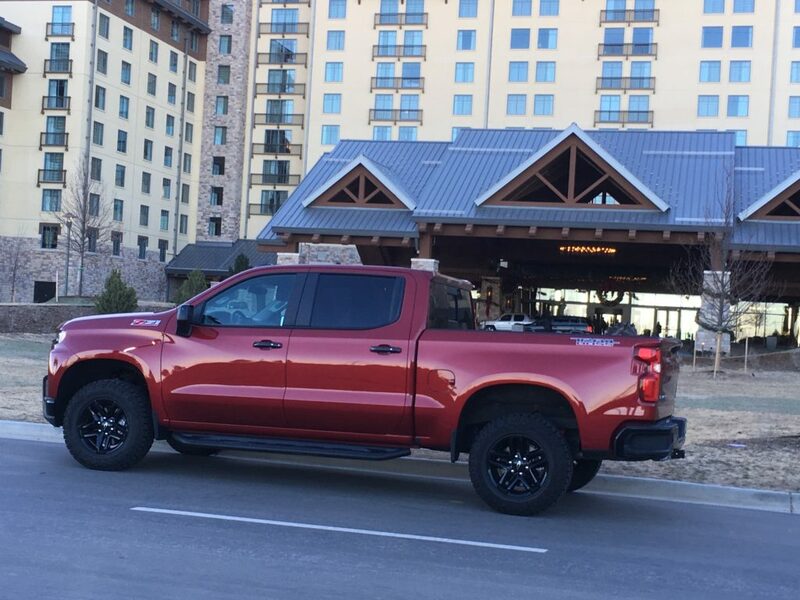 The Silverado Trail Boss 1500 is a modified version of the Z71 LT 4X4 model and sports a 2-inch lift on the suspension and 4-inch-longer wheelbase. Complementing a new, upright grille are red recovery hooks, boomerang-style headlamps and rounded fenders. A 6-foot box with easy-drop tailgate and convenient cornersteps in the rear bumper is highlighted by CHEVROLET, in capital letters, stamped across the back of the tailgate. Strong performance comes from the 335-horsepower/385-torque, 5.3-liter V-8 engine tied to a smooth-shifting 8-speed automatic transmission. Four-wheel drive is engaged through push-buttons to the left of the driver. My driving time, split from highway to in-city to offroad, averaged 18.1 miles per gallon (EPA estimate 15/20). Black alloy wheels are shod with Goodyear Wrangler Duratrac LT275/65R18 M&S tires; they’ll keep the Trail Boss moving over rocks and ridges in the hills and through mud and water down by the river, while out on the open highway they sing a slightly noisy tune. Like its most-serious competitors, the Ford F150 and Ram 1500, Chevy has added noticeable roominess to its rear-seating area, and a handy stow box has been carved out beneath the bench seat. Nine thousand bucks worth of options, including Bose sound, leather, lane-change alert, bedliner and advanced trailering package, raised sticker price to $57,285; there is no navigation.